​Dr. Charlie Stoehr is the senior veterinarian on staff. Plattsmouth is his home town, and he was raised on a farm on the Platte River, and educated in Plattsmouth Community Schools. 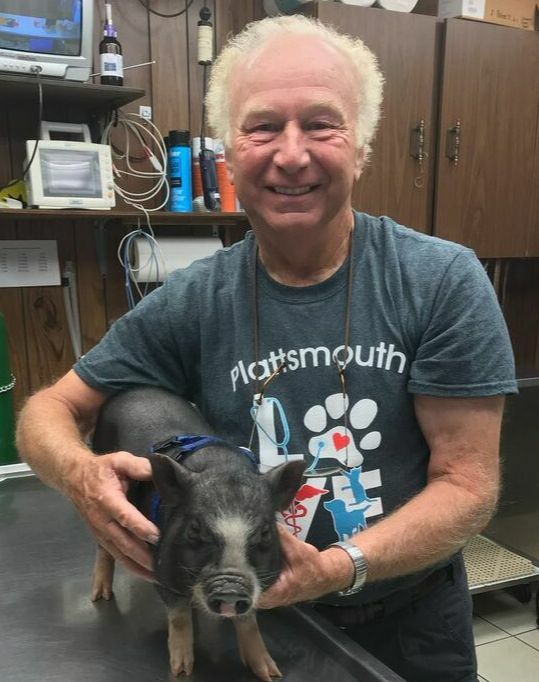 After securing his BS and DVM degrees from Kansas State University in 1966, he returned to Plattsmouth and established the Plattsmouth Veterinary Clinic P.C. (now named the Plattsmouth Animal Hospital P. C.) in downtown Plattsmouth. The hospital has been at its present location since 1973. While at Kansas State University, Dr. Stoehr was a member of Alpha Gamma Rho Fraternity, Alpha Zeta and Blue Key Honoraries. He was a Captain in the Air Force Reserve and currently is a member of Rotary International, and the Nebraska and American Veterinary Associations. He and his wife Beverly are the parents of three grown children, Dawn, Scott, and Robin. Dr. Stoehr has a special interest in small animal surgery, orthopedic surgery, and feline medicine. He enjoys tennis, travel, skiing, biking, hiking and caring for their Beagles “Marcie” & "Lumpie". ​Dr. Elizabeth Nelson has been on the staff of Plattsmouth Animal Hospital since 1992. An honors graduate from the University of Nebraska-Lincoln, Dr. Nelson completed her DVM degree from Iowa State University in 1983. She spent 1983 through 1992 in Alaska, working primarily with dogs, cats, and exotic pets. She was a race veterinarian for the Yukon Quest International Sled Dog Race in 1984 and for the Iditarod in 1992. Hailing originally from Albion, Nebraska, she and her husband, Rick, now reside south of Murray. They are the proud parents of two grown daughters, Synneve and Krista, their Huskies, Angel & Natalie, “Nick” the Horse, and ponies “Ruby” and “Penelope”, along with lots of barn cats (including Captain, Molly, Macy, and JimBob). Internal Medicine is her practice specialty and she also enjoys welcoming new puppies and kittens into our practice. Dr. Robin is a Plattsmouth native and graduated from the Plattsmouth Community School system. She attended Kansas State University and received her BS in 1998, followed by her DVM in 2003. She joined the Plattsmouth Animal Hospital staff following graduation in the summer of 2003, Dr. Robin has special interests in small animal dermatology, internal medicine and surgery. Dr. Robin, her husband Charles, and their three sons Langston, Ezekiel, and Alexander live in Plattsmouth with their dog, "Bob" and their cats, "Maleek" & "Sheldon Marie". Dr. Robin enjoys spending time with her family, sports, exercising, entertaining, and her book club. She is a member of Rotary International, and P.E.O - Chapter F. and enjoys working with the young people in the community schools to heighten their interest in all aspects of veterinary medicine and becoming veterinarians. Dr. Nicole Plucker grew up on a farm in Parker, South Dakota and joined the Plattsmouth Animal Hospital staff in June of 2014. She is a 2010 graduate of South Dakota State University, where she ran cross country and track. Dr. Plucker completed her DVM degree at Iowa State University in the Spring of 2014, and also spent some time studying abroad, in Australia, while pursuing her doctorate. Dr. Plucker's professional interests include small animal surgery and internal medicine. Outside of work, she and her husband enjoy running (including two marathons), swimming, reading, and exploring Plattsmouth, Omaha, and the surrounding areas. And spending time with their cats, June Bug and Calvert. ​Dr. Stephanie Peetz grew up on an acreage near Glenwood, Iowa and joined the Plattsmouth Animal Hospital team in June of 2015. She is a 2011 honors graduate of Iowa State University, where she graduated with a Bachelor’s degree in Animal Science. Dr. Peetz completed her DVM and graduated with honors from Iowa State University again in the spring of 2015. Dr. Peetz enjoys all aspects of veterinary medicine including small animal surgery, internal medicine, dermatology, and ophthalmology. Dr. Peetz’s interests outside of work include horseback riding, participating in sprint triathlons, and spending time with her family, which includes her husband Ryan, two cats (Winston and Icky), a Labrador Retriever (Ripley), and her two horses (Scout and Bean). Hobbies: sports, wake-boarding, snowboarding, and being outside. Lisa grew up in Red Oak, Iowa and joined the Plattsmouth Animal Hospital team in October, 2010. She graduated from Iowa Western Community College with a degree in Veterinary Technology in 2010. Lisa's favorite part of being an LVT is helping patients with oral health care, and preventative care. Outside of work, she enjoys spending time with her husband, Ryan, and their two girls. She is also a fan of gardening, horses, and trying out new recipes. She and her husband have a small herd of livestock that also keep them busy, along with their dogs, Duke & Elly. The Plattsmouth Animal Hospital also has many Veterinary Assistants, Kennel Technicians, and Receptionists ready to meet the needs of you and your pets. We love our patients!